The agreement between the Liberal and New Democratic parties to form a proposed coalition government has raised a number of key questions from a practical day-by-day perspective, such as how such a coalition might operate in practice. This article provides an overview of the structure and policies of a possible coalition government, focusing on the two accords signed by the Liberals, NDP and Bloc Québécois on December 1, 2008. The agreements signed by the Liberal and New Democratic parties outline the basic framework for a coalition government. Before examining the details of this agreement, it is useful to first discuss the general concept of a coalition government. Under Canada’s parliamentary system, coalitions may be contrasted with more common types of government, such as majority and minority governments. Majority governments refer to cases in which one political party forms government with a clear majority of elected representatives in the legislature. This means the governing party has more representatives than all of the opposition political parties combined. The leader of the political party that wins a majority government usually assumes the role of prime minister, and is able to hold the confidence of the legislature using party discipline (a practice in which the leadership of the party uses certain tactics, such as the threat of demotion or expulsion from the party, to ensure caucus members “toe the party line”). In Canada, majority governments tend to be the norm; a recent example is an era of successive Liberal majority governments helmed by Prime Minister Jean Chrétien from 1993 to 2003. Minority governments, by contrast, occur when one political party forms government, but without a clear majority of elected representatives in the legislature. Under such a circumstance the political parties that make up the opposition have, combined, more elected representatives than the governing political party. In this case, the governing party cannot hold the confidence of the legislature through party discipline alone, but must seek out the support of opposition parties. In Canada, minority governments have become the norm in the early years of the 21st century, though most tend to be short-lived. Recent federal examples include the minority government of Liberal Prime Minister Paul Martin (2004-06) and Conservative Prime Minister Stephen Harper (2006, 2008). Coalition government represents a third type of government in Canada’s parliamentary system, a concept that involves two or more political parties entering into a formal agreement to govern together. As such, coalitions differ from both majority and minority governments in that a single political party does not form government. Instead, members from at least two political parties form the government and take positions in the cabinet. Coalition governments are very rare in Canada; since Confederation, there has only been one coalition government at the federal level — the Union Government (1917-20). In European parliamentary systems, however, coalition governments are much more commonplace. Many of the details regarding a possible Liberal-NDP coalition government will be decided when and if the parties take office. Nevertheless, the Liberals, NDP and Bloc Québécois outlined the coalition government’s basic framework in two agreements: An Accord on a Cooperative Government to Address the Present Economic Crisis, which was signed by members of the Liberal and New Democratic parties, and A Policy Accord to Address the Present Economic Crisis, a document signed by all three parties. In regard to the coalition’s makeup, the agreements clearly assert that only the Liberal and New Democratic parties will form government; under such an arrangement, the Bloc Québécois would remain an opposition party within the House of Commons. That said, the Bloc did agree to neither move nor support any motions of non-confidence against the coalition government until June 30, 2010. Moreover, the Liberals and the NDP agreed to put into place a permanent mechanism to consult with the Bloc on matters. Should the coalition become reality, such arrangements would be critical, as the Liberals and NDP together do not have a majority in the House. Accordingly, they would have to work with, and rely upon, the Bloc’s support to remain in power. The Liberal-NDP Accord on Cooperative Government goes on to establish a number of basic rules for a possible Liberal-NDP coalition government. Regarding the office of the Prime Minister, the Accord stipulates that nothing in the agreement is “intended to diminish or alter the power and prerogatives of the Prime Minister.” In other words, the Prime Minister of such a coalition government would exercise the same role and authority as in any other government, and the powers of the office would in no way be limited or shared, despite the fact that two parties would be governing Canada under such an arrangement. The Accord goes on to assert that a coalition cabinet would consist of 24 ministers plus the Prime Minister. Under the agreement, the designated Prime Minister would be the leader of the Liberal Party, while the Minister of Finance would also be appointed from the Liberal caucus. This is significant in that these two positions are the most powerful in the federal cabinet. 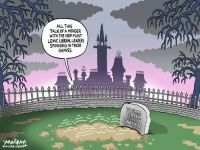 In total, the Liberal Party would receive 18 of the 24 cabinet positions, while the NDP would receive six cabinet posts. Aside from the roles of the Prime Minister and the Minister of Finance, the agreement is silent on which specific cabinet positions would be allocated to which political party, except to say that such appointments would be made by the Liberal Prime Minister in appropriate consultation with the leader of the NDP. On the matter of other federal government appointments, such as in the public service and other federal bodies, the Accord stipulates that both the Liberals and NDP are committed to “restoring the integrity, transparency and efficiency of the appointment process.” The Accord goes on to assert that the Prime Minister would consult the leader of the NDP as appropriate on such appointments. The Accord further establishes a standing managing committee, which would meet regularly to ensure the good order of the Accord; deal with key issues that may arise over the course of the coalition’s life; consult on key appointments; and resolve any disputes that may arise. This standing committee would include the Prime Minister, the leader of the NDP, and any other persons as deemed appropriate by the leaders. Another issue addressed by the Accord is the relationship between the Liberal and NDP caucuses. Under the agreement, both caucuses would continue to meet as distinct and separate groups; the two, however, could meet jointly to address issues of concern to both parties. Under the Accord, both parties would be entitled to offer advice to the government, and the two caucuses would sit next to one another on the government benches in the House of Commons. Finally, the two accords provide for an expiration date for the coalition government, with both parties (the Liberals and the NDP) agreeing to respect the accords until June 30, 2011, while the Bloc Québécois would respect the agreements until June 30, 2010. The Policy Accord to Address the Present Economic Crisis, signed by all three parties, outlines the basic principles and policies of the possible coalition government. Overall, the Accord’s primary policy focus is the “present economic crisis,” which refers to the economic slowdown that began in earnest in September 2008, and a recession projected for 2009. That said, the three parties also agreed to other policies not directly related to the economy (see below). Fiscal responsibility: The parties agreed the government should provide active stimulus for the economy in 2009 and 2010, with a shared commitment to return to government surpluses within four years (by 2012). Economic stimulus package: The top priority of a Liberal-NDP coalition government would be the provision of an economic stimulus package. This initiative would involve increased government spending in key areas, such as (but not limited to) new infrastructure investments (at the municipal, inter-provincial and First Nations levels), housing construction and retrofitting; and strategic economic sectors, such as manufacturing, forestry and automotive (which may include an aid component). Rapid support for those affected by the economic crisis: The coalition government would be committed to ensuring appropriate programs for those most affected by the economic crisis. This includes facilitating skills training to help ensure employment success in a rapidly changing economy; reforming the Employment Insurance program; lowering the minimum required Registered Retirement Income Fund (RRIF) withdrawal for 2008 by 50 percent; reforming bankruptcy and insolvency laws to better protect pensions; and implementing an income support program for older workers who have lost their jobs. Global financial reform: The coalition government would be committed to working with the international community, particularly with G-20 partners, in pursuit of an effective new global financial architecture. work with North American partners to pursue a continental cap-and-trade market with absolute greenhouse gas emission targets, using 1990 as the base year.